CIMB-Principal Asset Management Bhd grabbed six individual awards at The Edge-Thomson Reuters Lipper Fund Awards 2018 — two more than last year. Three funds repeated their winning feat. 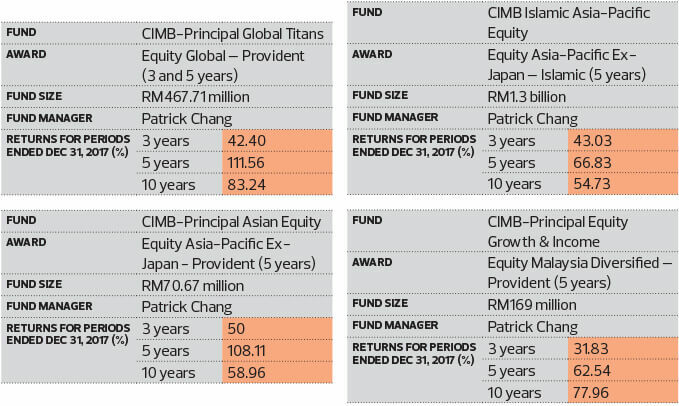 CIMB-Principal Global Titans won the award for Best Equity Global (Provident) in the three and five-year categories, CIMB-Principal Asian Equity took home the award for Best Equity Asia-Pacific Ex-Japan (Provident) in the five-year category and CIMB Islamic Asia-Pacific Equity clinched the award for Best Equity Asia-Pacific Ex-Japan (Islamic) in the five-year category. 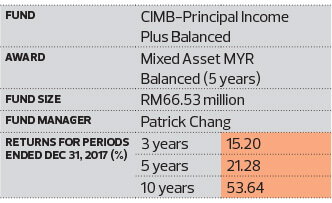 This year, CIMB-Principal Equity Growth & Income won the award for Best Equity Malaysia Diversified (Provident) in the five-year category while CIMB-Principal Income Plus Balanced was awarded Best Mixed Asset MYR Balanced in the five-year category. CEO Munirah Khairuddin describes the fund house’s investment philosophy as an “early identification of change”. She says the essential factor for making successful investments is to identify fundamental changes and then select the right securities, all before the others notice or act upon these changes. Munirah says CIMB-Principal Global Titans has benefited from this philosophy as well as the robust investment process. “For example, when the US markets weakened considerably due to the disappointment over President Donald Trump’s failure to pass the Healthcare Reform Bill, as well as fears over investigations into Trump’s campaign infringements, we took the opportunity to step up our allocation to the US, with the view that underlying US corporate earnings growth would be among the strongest in the developed world,” she adds. She says CIMB-Principal focuses on the longer-term fundamentals to avoid being wrong-footed in a volatile market. She points out that ultimately, the value of an investment rests upon the quality of its earnings, discount rate and cash flow growth. As long as global economic growth remains robust, Asian assets are still attractive relative to the rest of the world, says Munirah. She adds that Asia is entering the rate hike cycle with fundamentally strong metrics, including improved credit accounts, low inflation and low indebtedness.